If you’re a healthcare practitioner using a Hushmail for Healthcare account to communicate with your clients, you might have wondered what Hushmail and its encrypted services look like to those on the receiving end. Do the instructions for creating a passphrase make sense? Are the web forms easy to fill out? As a practitioner using Hushmail, it’s important that you understand your clients’ experience with the service. In today’s post, we’re going to show you exactly what your clients experience when you communicate with them through encrypted email or when they fill out one of your secure web forms. Receiving encrypted email is a little different from regular email, and it’s helpful to have an idea of what your clients see on their end so you can better inform them when you first introduce the service. First, you have the option of sending an email that’s encrypted or not encrypted. If you send an email that isn’t encrypted, it will arrive in your client’s inbox just like any other email. They can open it immediately and respond. Of course, it won’t be encrypted. If you’ve signed up for Hushmail, it’s because you want a secure way of communicating with your clients, and you’ll likely want to encrypt your email. To do this, simply choose Yes to encrypt when you compose an email. When you choose Yes for Encrypted, you’ll be given the option to add a security question. You don’t have to do this, but if you plan on sending sensitive information, we recommend this step. So, how will this look to your client? Secure email enforces the use of multiple layers of encryption, which is a method of scrambling information so that it cannot be read by anyone other than the intended recipient. How can I be sure this email is legitimate? When you arrive at the Hushmail Secure Email website, be sure to check the following: the address bar of your web browser shows https://secure.hushmail.com/pickup/ and a small picture of a padlock appears in the address bar. 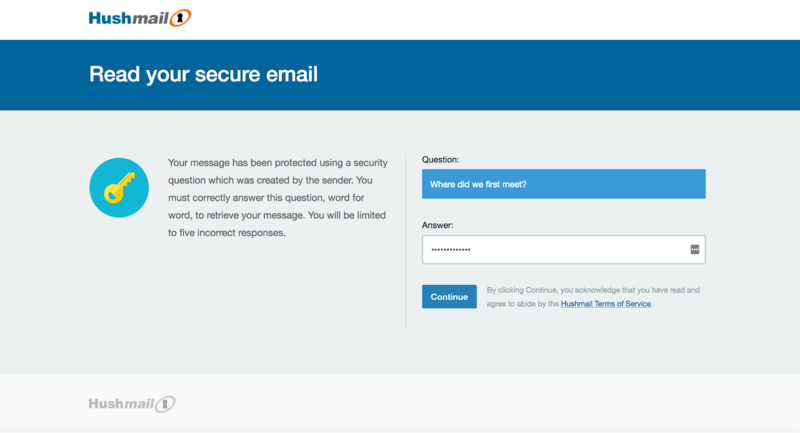 When your client clicks on the Read your secure email link, they’ll be taken to a secure webpage and asked your security question (if you chose this option), then instructed to create a passphrase. If you chose to not ask a security question, then your client will be taken directly to the passphrase page. Once the passphrase is saved, your client will be able to securely read and respond to the initial message, as well as any future encrypted messages you send. Keep in mind that your clients will only be able to access your message for a set period of time after the message is sent. By default, that period is two weeks. If you would like to extend that period, contact our Customer Care Team. As part of your Hushmail account, you can use Hush Secure Forms to build customized, encrypted web forms that are perfect for efficiently collecting information from your clients. The process of filling out one of our forms is very straightforward. Your client will access your form either as an embedded form on your website or through a link in your email signature or social media page. When you’re building your form in the form builder, you can always preview what your clients will see by clicking on the Form public web address link at the top of the page. You can even fill the form out yourself to fully understand your client’s experience, but to save you the trouble we’ll go through the steps here. After filling out and submitting the form, your client will be taken to a page telling them that their message (the form) was successfully sent. If you choose to include an automatic response, which you can find in the Form settings when you build your form, your client will receive a message in their inbox informing them of the time their message was sent. You will receive the completed form in your inbox. If you decide to respond to a web form submission, your client will receive your response just as if it were an email using Hushmail. All of the same passphrase and security question criteria apply. Your response to the form will include the answered web form at the bottom for easy reference. As you can see, using Hushmail and Hush Secure Forms is an easy way to communicate with your clients. Once they answer a security question (if you choose this option) and establish their passphrase, the only requirement is to remember the passphrase. If your client forgets their passphrase, they can create a new one but will no longer have access to past messages. 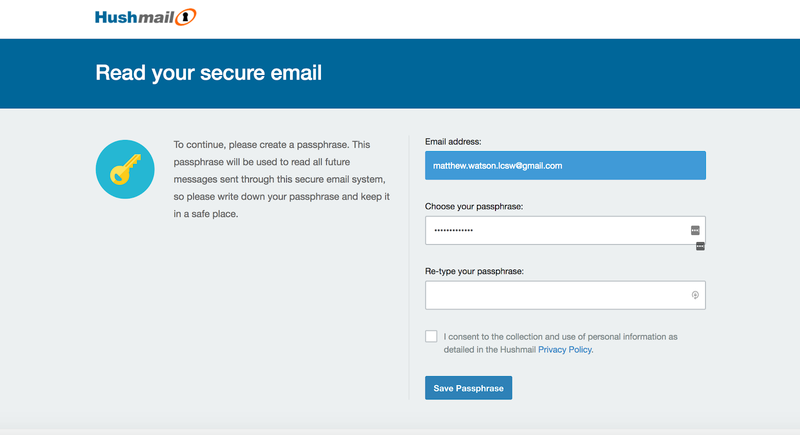 As with any new service, there may be a slight learning curve when switching to Hushmail. Because of this, it’s a good idea to mention Hushmail to your clients before you send the first encrypted email. 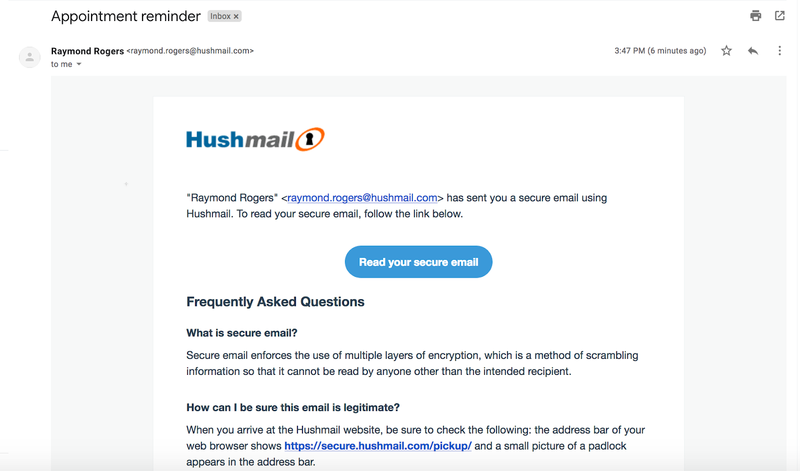 Download your handout "Welcome to Hushmail: A new user’s guide to encrypted email"
Please feel free to print out copies or email the handout to your clients. Or consider posting it on your website so your clients always have easy access to answers if they have questions about Hushmail. Don’t have a Hushmail for Healthcare account? 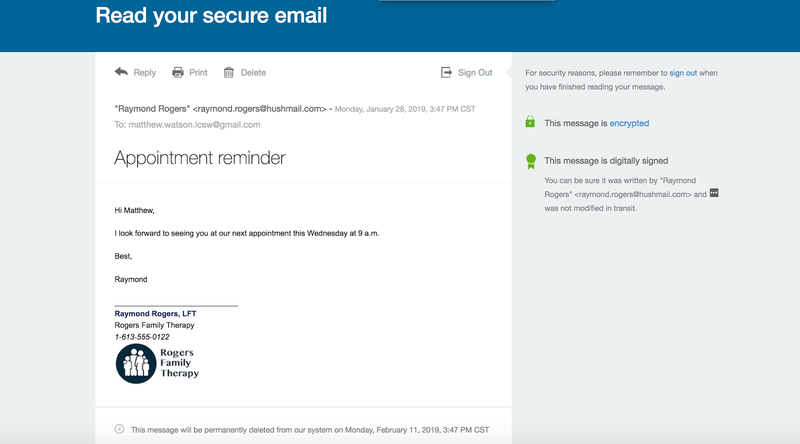 Take a close look at what your clients experience when you communicate with them through encrypted email or when they fill out a secure web form. Receiving encrypted email is a little different from regular email, and it’s helpful to have an idea of what your clients see on their end so you can better inform them when you introduce the service.